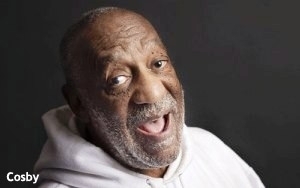 Whose bright idea was it to bring back Bill Cosby for an NBC sitcom in the first place? NBC first confirmed this news last January, but provided almost no details such as when it would debut, who would be in it, a title -- that kind of thing. Various news stories at the time reported that Cosby, then 76 and now 77, would play the patriarch of a multi-generational household who would dispense his advice and wisdom about life to the various members of his extended family. Yawn. At some point in the evolution of this story, producer Tom Werner became attached to this project. He has produced dozens of TV comedies -- some successful, some not -- including the old “Cosby Show” from the 1980s and “Roseanne” (two of the successful ones). But apparently no one was able to put this new Cosby show together before the network upfronts last May, so the show is still nowhere to be seen. And there’s been no evidence, such as announcements or publicity of any kind emanating from NBC, that it will materialize anytime soon. Whether or not this thing is even being actively pursued is an open question. This week, the TV Web sites have caught up to the sitcom angle, with various stories asking whether a new Cosby sitcom is tenable under these new nasty circumstances. The stories are questioning whether audiences can accept Cosby as a kindly, wise grandfather with these accusations swirling around him. The answer is probably no -- but it’s also possible that this sitcom had only a 50-50 chance (or less) of getting off the ground anyway. I have no idea whether Cosby is innocent or guilty of all these charges. But I do know this: The Bill Cosby that NBC says it is developing a sitcom for is not the same Bill Cosby who turned NBC into the top network of the 1980s. Today’s Cosby is no longer Cliff Huxtable or Uncle Puddin’ Pops. Like millions of others, I have a soft spot for Cosby because he’s been around so long. Several generations of comedians also revere him, which is why he turns up several times a year on the late-night shows. But if you’ve seen him on these shows, it might not have escaped your notice that Cosby has become something of an oddball. Most of the time, his appearances on the late-night shows are characterized by strange mannerisms and pronouncements that come across as bizarre and incomprehensible. In these appearances, he makes you wonder: Hey, what’s happened to Bill Cosby? Probably, the answer is: He aged. And that’s no crime. But it’s also likely true that if NBC were to bring Cosby and his late-career mannerisms to a new sitcom, viewers won’t stick around long to watch it, scandal or no scandal.